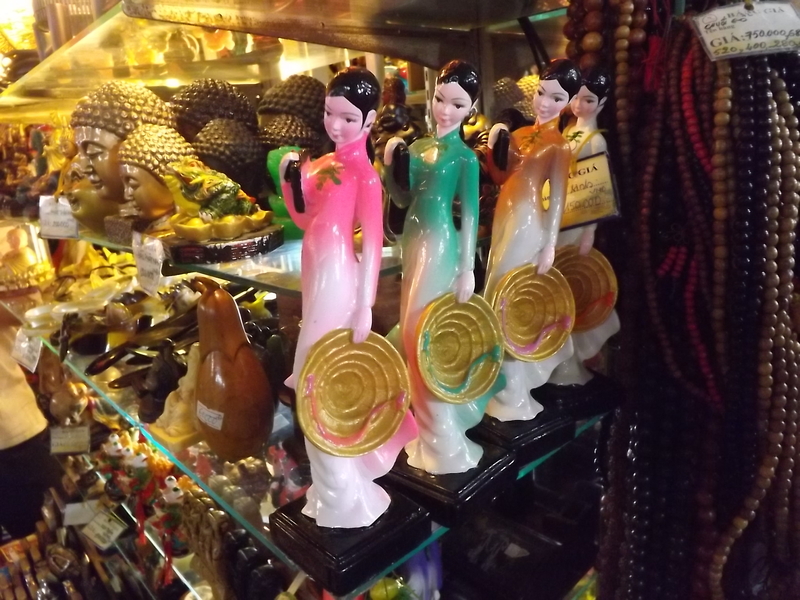 Like many of the countries to come, Vietnam just wasn’t one of those places I ever saw myself going to, although it is one I really felt excited about. We ported into Vietnam and instantly I noticed how hot it was. We went from below 30’degrees in China to over 100 in Saigon, Vietnam! Finally, warmth! The cold has its charm, but I am really a summer-time type of person. My first night out in Vietnam was amazing! I had the local shuttle take me down town where a lot of SASers were gathering. I had originally gone with one guy and another girl but when we got there I found two of my closest guy friends just looking about with no real plan. So we all agreed to head out and grab a bite to eat at a very random hole-in-the wall restaurant, which turned out to be amazing. Seafood hotpot, giant prawns and eggrolls really hit the spot! Cheers to a Saigon Beer, and then exploration around the city. Eventually we split off and it was just I and my two friends. We decided to get massages, which is what Vietnam seems to be famous for. For 15 bucks I got a facial, foot, leg and head massage and it was extremely relaxing…..in the states a facial alone would be 40+. Before the massages we stopped at a Vietnamese coffee place, where we had Weasel Coffee (a Vietnamese delicacy) What’s that you ask? Are you sure you want to know? Well, they feed the weasels coffee beans, they ferment in their tummies…and I am sure you can guess the rest. It was the strongest coffee I have ever drank ! By the way, it was Valentine’s Day this night, and at the end the waiter gave me free dessert! It was truly a blast! We stopped by an amazing outdoor market, and on the streets locals were selling nick-knacks, I stopped along the way and bought a really nice bamboo flute for my dad, a traditional instrument of Vietnam. 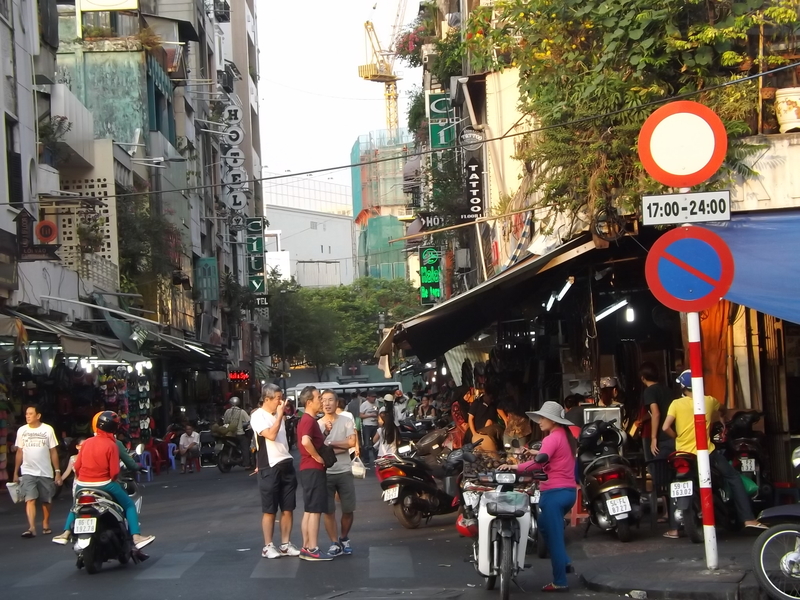 The city where we ported, Saigon, is extremely bustling and fun! Abundant with plenty of bars (filled with tourists), places to eat and shops, it really is a hotspot. On the roads are endless amounts of motor bikes. I never took a taxi in Vietnam…because getting on the back of a motor bike and paying a dollar to a local just seemed so much more thrilling. I know it seems crazy, and in a way it was, but it’s something you must do in Vietnam. Locate a trustworthy local, usually you know they are responsible if they hand you a helmet. Not only is it fun, but it helps out the local community. 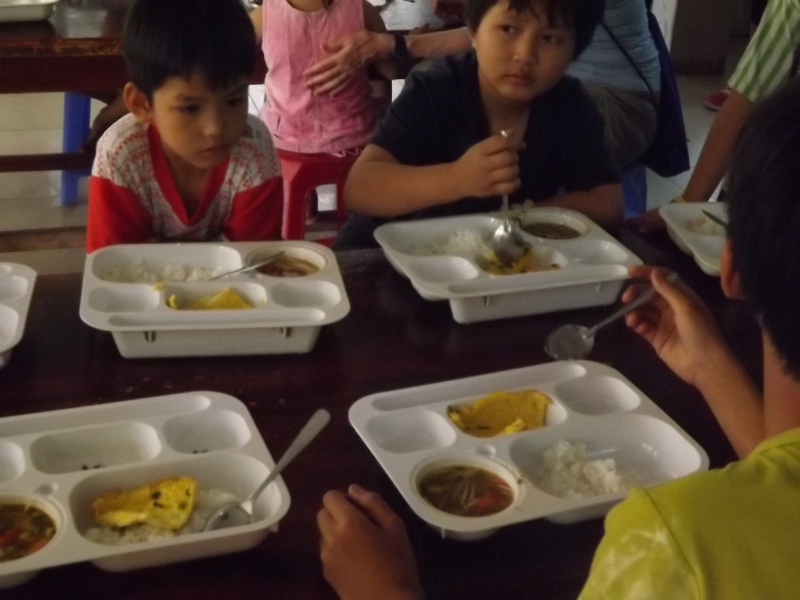 Later on into my Vietnamese experience, I took a trip to a local orphanage with a trip organized through Semester at Sea. 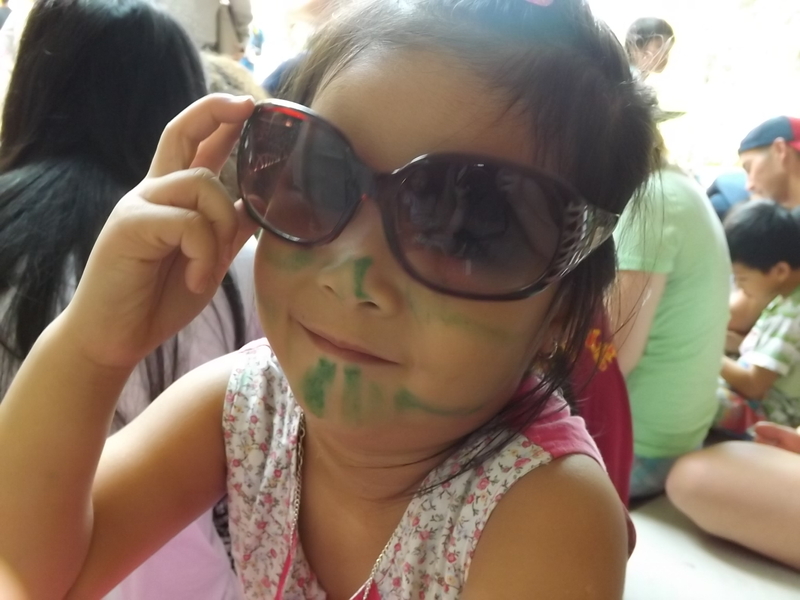 My first impression was that it was dirty and smelled horrible, but after opening my eyes a little more, the environment for the kids was actually spectacular; a perfect sense of community, meals, clothes, balls and smiling faces. The children swarmed my crayons and coloring books I brought for them. The kids really got a kick out of my sun glasses! Eventually I found myself traveling with a group of friends back into the city during the day. Today’s destination was the War Museum. I had to remind myself where I was, and who I was, in this beautiful country that suffered not too long ago (and still suffers in many aspects, although greatly improving and developing) Reading signs and seeing pictures of the victims of Agent Orange due to the war in Vietnam that horribly deformed people and left children deformed before birth. I was horrified, but also left with hope. 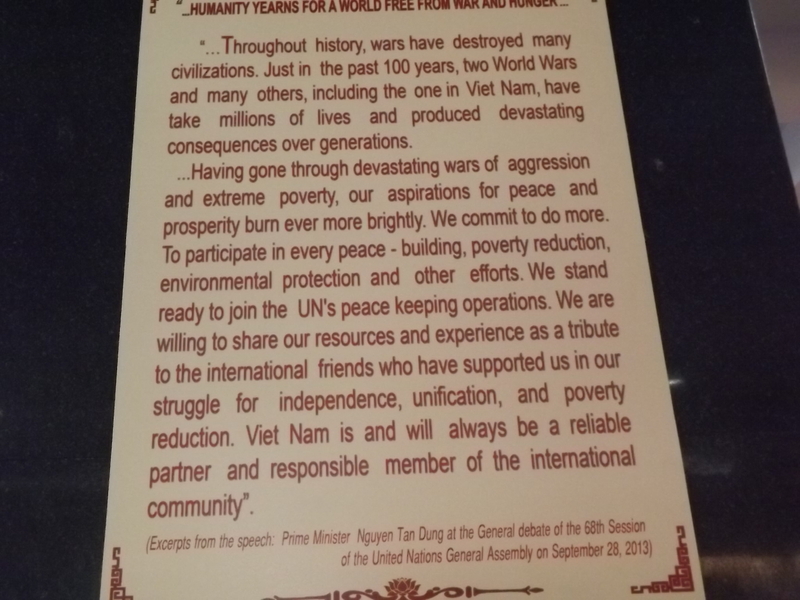 Other signs showed Vietnam’s determination for success, and how they have come through the hardship and now work as one of the U.S’s greatest allies. 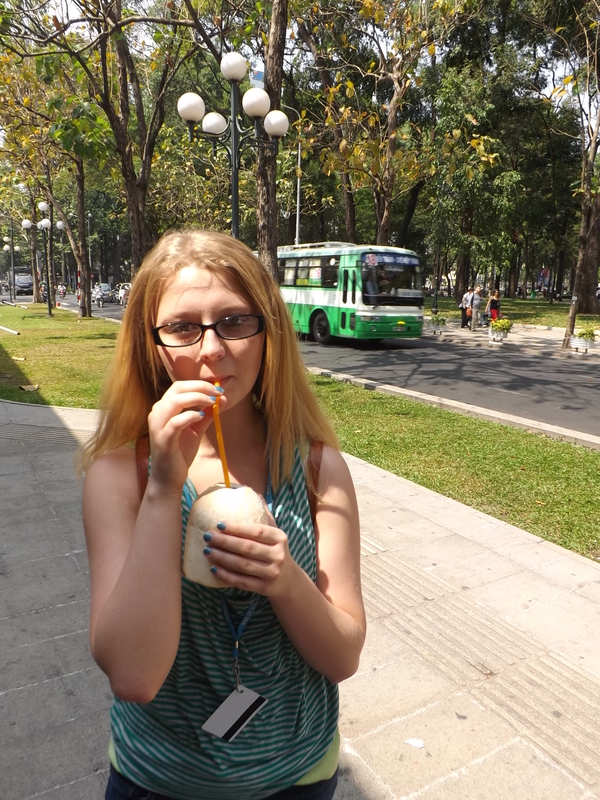 On the way back from this day trip my friend got me some coconut water sold by a random vendor on the street! On my final days in Vietnam I spent them in the Mekong Delta. We road rafts and canoes down the river, where we stopped to hike and explore nearby villages. We took a boat to a nearby cabin where we spent the night in mosquito nets and had cooking lessons outdoors. 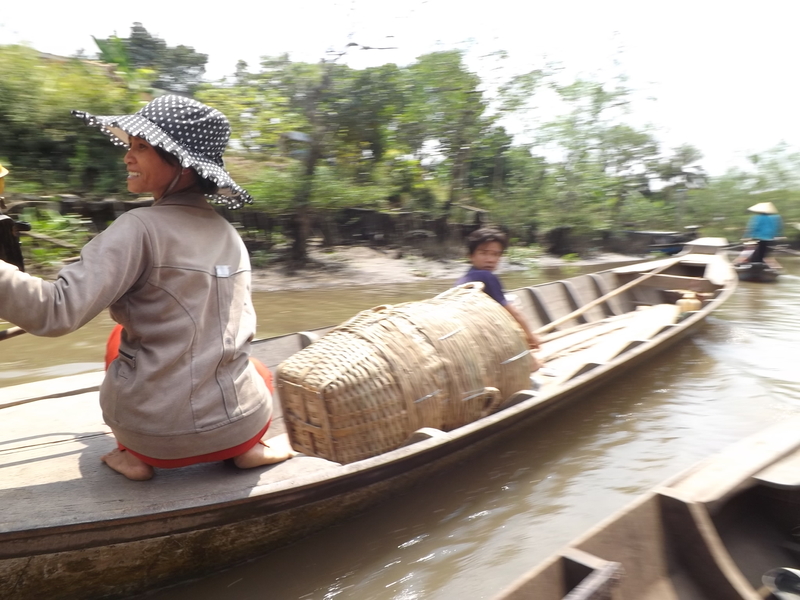 The next day we visited the largest floating market in the world, and continued our boat ride down the river, we passed locals working and children playing. What I loved most about this was everywhere we went there seemed to be hammocks! I found myself drifting to sleep on many occasions. 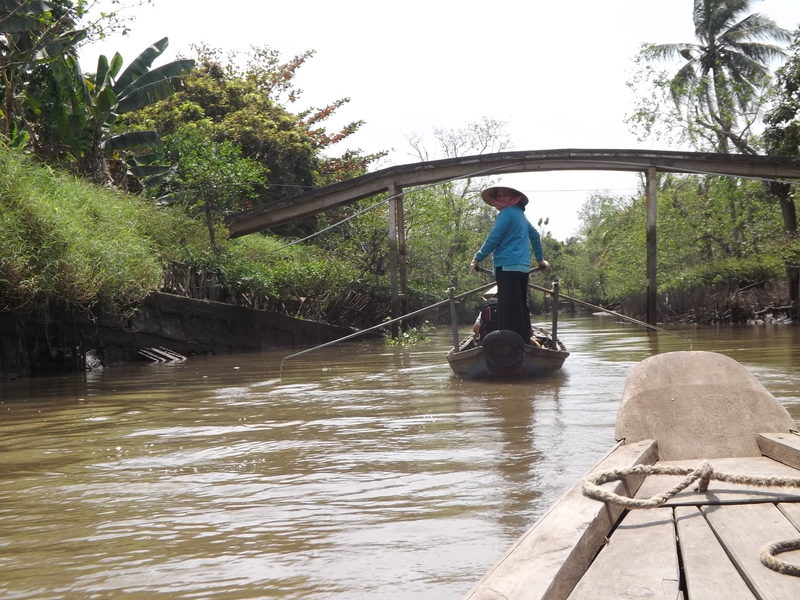 On one day we even rented bicycles and road them around the Mekong Delta villages, where we passed little hut-houses, farms and animals galore! Locals and children always smiled and waved loudly at us as we passed, welcoming us to Vietnam! 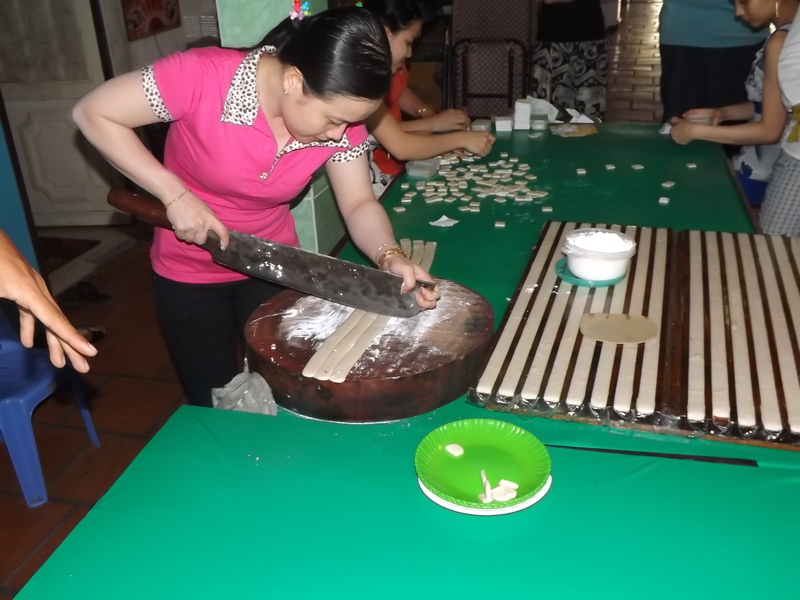 At one point we event stopped at a little workshop where we sampled and watched locals make coconut candies, which was absolutely delicious! 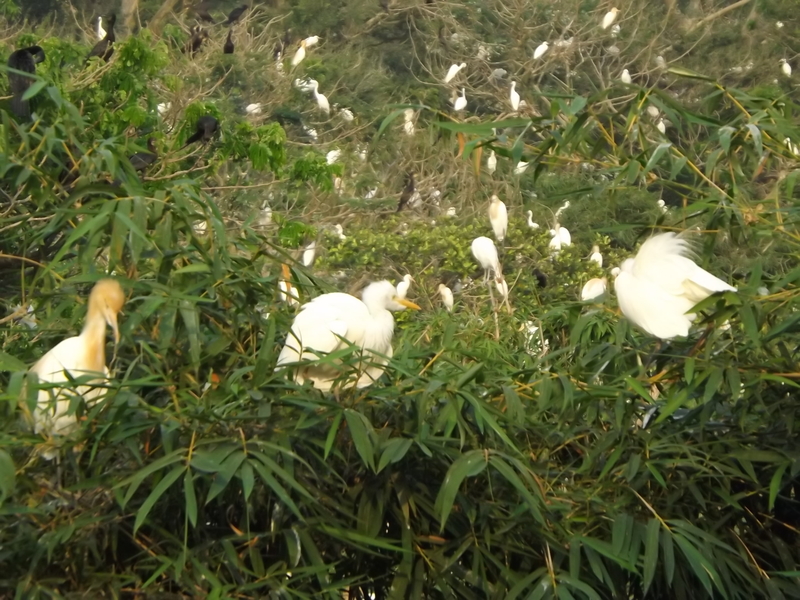 On my final day we hiked to an area that had hundreds upon hundreds of birds (mostly egrets) among the treetops! 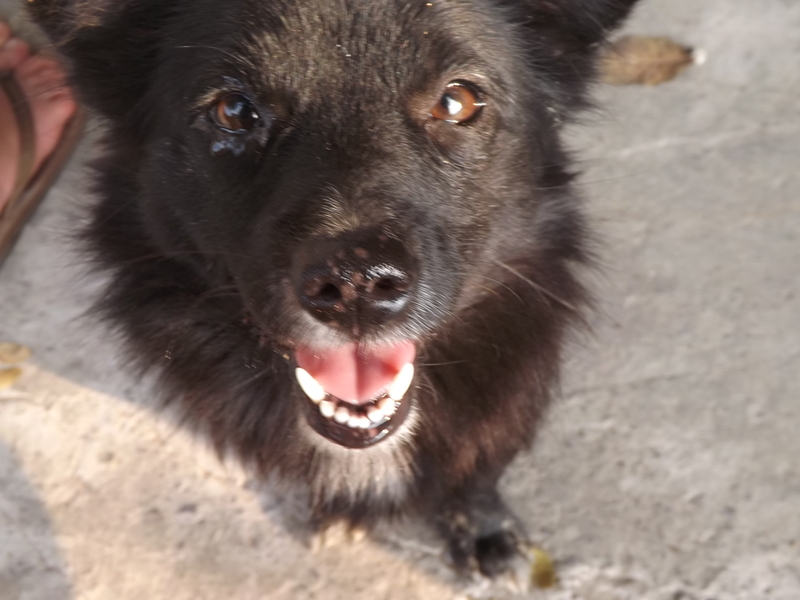 Oh and there are lots of REALLY cute dogs wondering around in Vietnam! I can’t say they are “stray” they are all taken care of by the greater community, although they technically explore and live as they like, these little furry cuties tend to find homes on their own. Vietnam was an amazing experience! I really hated to say goodbye, there was still SO MUCH that I did not get to see! I missed Ha Long Bay,and the Cu Chi Tunnels, but with only 6 days (and the amount I did see) I can’t exactly complain! See’ya Vietnam, and hello Singapore! 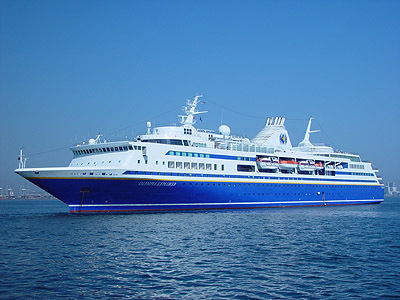 The MV explorer; my new home for the next 4 months! 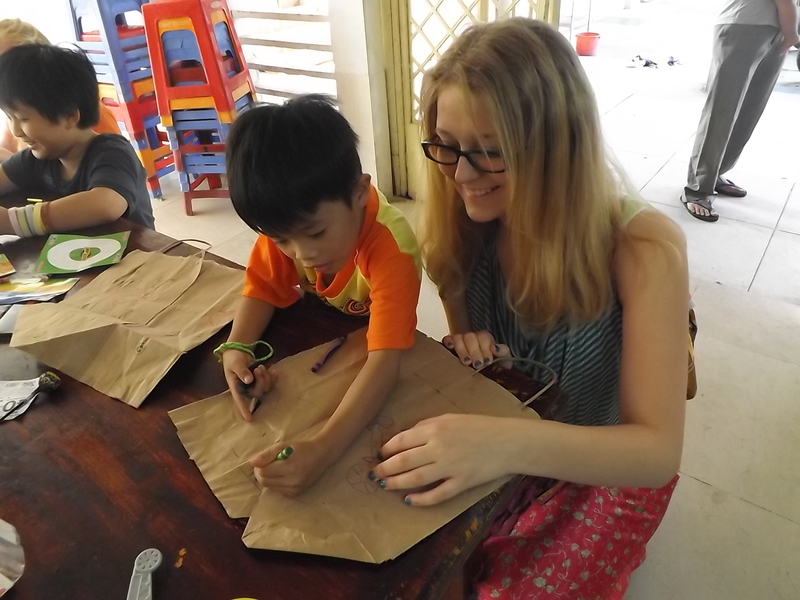 Spring 2014 Semester at Sea blog! Hey guys! Have not heard from anyone in a while, but of course this is because I have not posted in a while. I’ve been home, in Michigan, doing my usual university-work lineup. Nothing special, but as some of you may already knew, in one month I leave for a Semester at Sea!! My amazing experiences in South Korea and Morocco were simply not enough for this crazy girl. I am excited to blog about this amazing opportunity here on my little wordpress! Spread the word because honestly I want people to hear about this opportunity and be pushed to it as well in life! Wait, what? Hold on a second Danni. What in the world is a Semester at Sea? Let me get this straight: you’re going to be living on a ship? You guessed it! 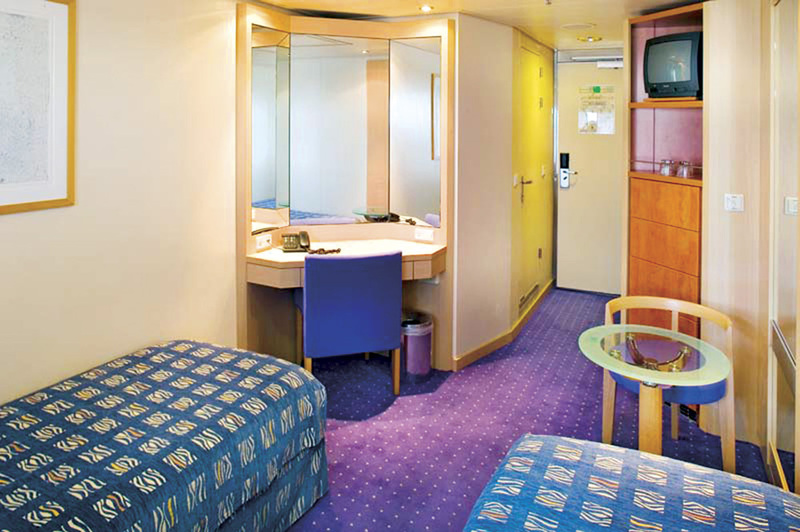 I live on a ship in double occupancy cabins! There are classrooms, pool areas, salons, food courts, ball rooms, a library, book store, snack booth – you name it and it’s there, everything I need to thrive while at sea! Naturally in ports (and we are in ports an average of 5 days) I will be traveling around and staying in hotels and such. And host families! So far I have plans to stay with host families in multiple countries in order to get the full cultural experience! And where exactly are you going? How can you afford this!? Well, I can’t. If it was not for scholarships and a work-study I earned for Semester at Sea I would not be going. I received a merit scholarship, need based scholarship and was hired for a competitive work-study. I am awaiting on one more scholarship that is worth 10,000 through an honors society, but it is unlikely I will receive it. (Only one was available. And a girl mentioned to me since she is involved professionally with the program she will pull some strings, so I just applied for a good shot!) I am also taking out loans and emptying out my savings. Unless I get that last scholarship, I will be eating ramen noodles for a year after I return. Worth it.